MILANO – La San Marco, a historic Italian manufacturer of espresso coffee machines and dosing grinders, confirms its participation at Host, the most important trade fair for the Ho.Re.Ca. sector, which this year marks its 40th edition, taking place at FieraMilano Rho in Italy from 20 to 24 October 2017. On a floor space of over 160 m2 , La San Marco (Hall 24 Stand B60/C51) is ready to welcome a whole host of visitors from all over the world, introducing important new products, both regarding traditional lever and automatic machines, with an exhibition which will alternate between the classic machines that have made the brand famous worldwide and its latest portfolio. Undoubtedly, the most anticipated new product is Leva Luxury, the latest creation by La San Marco which, for the first time, literally lays bare a coffee machine. Leva Luxury is a fascinating high-end lever model, incorporating LEVA CLASS® (Controlled Lever Anti-Shock System) latest generation technology, set off by the eye-catching, tempered glass bodywork. 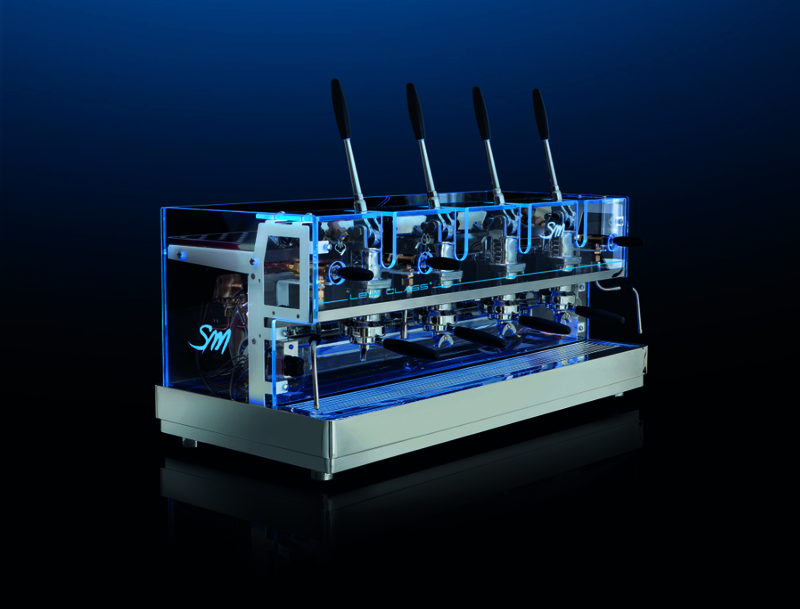 The transparent bodywork of Leva Luxury catches the attention, showcasing the technological solutions, the variety of components and the sophisticated precision of the inner workings, typical of La San Marco coffee machines, resulting in a high-class machine with great visual impact. The innovative look of this model is characterised by the highly attractive details: an infinite variety of glass bodywork colours, made possible by the integrated RGB LED lighting system, the chrome plating of the cylinder sleeves, the use of elements in carbon fibre, completed by the chrome finish of all the internal components and the stainless steel boiler. Leva Luxury is available in three versions with 2, 3 or 4 groups and guarantees a high-quality espresso coffee. Its unmistakable design will make the most prestigious bars and restaurants all over the world fall in love with it. The spotlight is also on the new dosing grinder dial by La San Marco with one hundredth of a millimetre accuracy. The new dosing system, developed in order to simplify and improve the final result of the cup of coffee, allows you to adapt the grain size of the ground coffee to the humidity, blend and type of grinding, with more precision than in the past. The novelty is not only aesthetic, thanks to a simplified graphics that makes regulation more intuitive, but also technical above all. The latest version of the dosing grinder dial means you can vary the distance between the grinding discs with an accuracy of up to one-hundredth of a millimetre, guaranteeing over 30% higher adjustment capacity compared to previous models. Thus to obtain an improved extraction of all the volatile coffee substances which means also a better concentration of aromatics in the espresso coffee. The new dosing dial is available for all La San Marco dosing grinders and it is fully compatible with the previous version. During the presentation of the new products to the public at Host 2017, the La San Marco team will be joined by a special guest: Daniele Salvatori, a professional coffee trainer and owner of Uba360, Barista and Barman School, who will alternate his performances between the lever and the automatic machines to prepare excellent coffee-based beverages. Mr. Salvatori will do short seminars and training sessions dedicated to Italian espresso coffee, extraction methods and Latte Art.